I have always felt the weight of my place and responsibility in helping solve the world’s problems. When I started at HKS in 2003, I soon learned that I’d have an opportunity to align my passions and talent with a community need that could help fulfill my deep desire to make a difference. HKS has a long history of giving back to the communities in which it does business, enabling me to explore connections that are meaningful to me in Washington D.C. Volunteering in our local schools was one way I engaged. This community service ultimately inspired my Master of Architecture thesis that I completed while working at HKS in 2009. I designed an elementary school focused on fighting childhood obesity through encouraging activity and access to healthy food. Why? In the D.C. area, 18.5 percent of youth ages 2-19 are obese, and adult obesity rates in D.C. stand at 23 percent. In neighboring Virginia and Maryland, adult obesity rates exceed 30 percent. I became intrigued by the problems of obesity and related chronic diseases and how they’re connected to food insecurity, poverty and education. There’s a growing body of information about urban “food deserts,” defined as a geographic area in which people have limited access to healthy food. Eleven percent of Washington D.C. fits that description. A recent study found that simply building more grocery stores in low income neighborhoods isn’t reducing nutrition inequality: disparities in income and nutrition knowledge is impacting our health and well-being. In 2015, I had an opportunity to connect the dots between my passion and craft while working with the local USGBC National Capital Region Chapter and the D.C. Greenbuild Host Committee on the Legacy Project Committee. 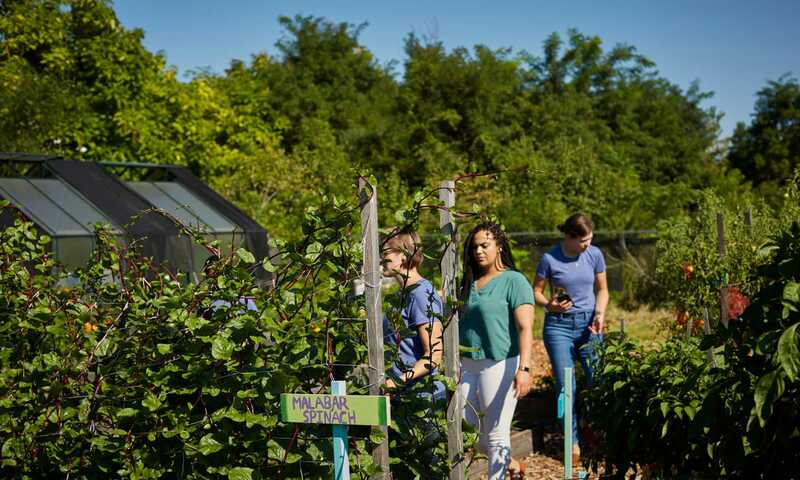 Greenbuild is an annual global sustainable building conference, and the Legacy Project is a permanent gift of education, service and thanks to the city that hosts the conference. A $10,000 seed fund grant gets the project started. 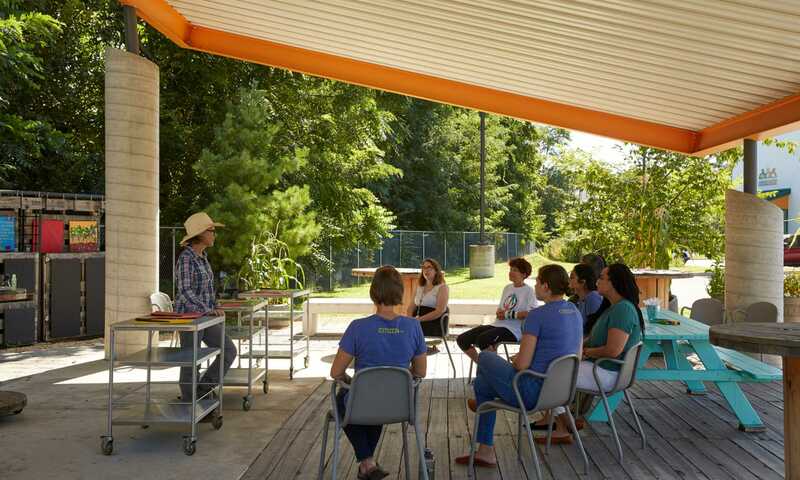 Through my volunteer work at the Capital Area Food Bank Urban Demonstration Garden, I learned that CAFB wanted to expand its garden education program by creating an outdoor classroom space. I encouraged them to submit a proposal via Citizen HKS, our firm’s public interest design studio, and Clark Construction. 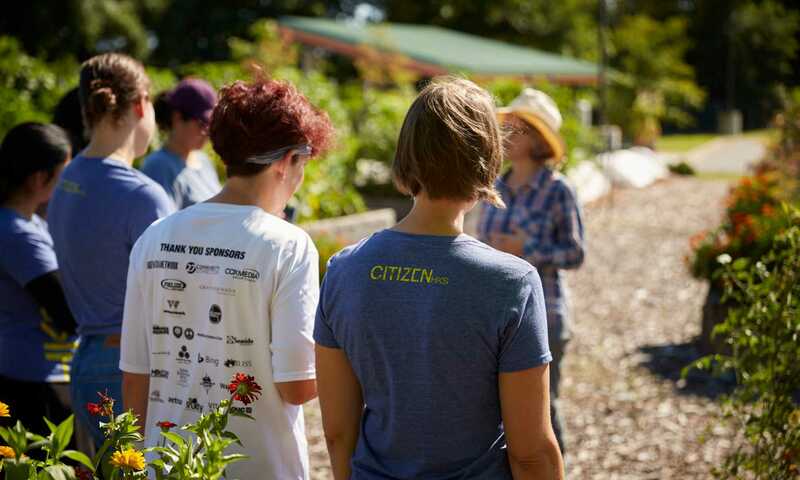 The proposal, The Urban Food Studio, was selected among 12 competing project proposals to provide CAFB with a hands-on, all-season outdoor learning space for gardening, cooking education classes, volunteer respite, workshops and other events supporting healthy food growing education programming. The space reflects the sustainable mission of the food bank by using reclaimed and recycled materials, by capturing and reusing rainwater from the roof in a cistern, solar panels for electricity, and supports programs that provides essential nutrition education that leads to self-sufficiency. The project team was honored at Greenbuild 2015 with the Malcolm Lewis Impact Award that recognizes the contributions of green building volunteers with a $5,000 award given to the CAFB. The Urban Food Studio has had tremendous impact on the food bank’s programs, the people they serve, and the produce they harvest. In 2017 alone, 570 people participated in 45 education sessions focused on food growing, cooking and hunger advocacy. Nearly 700 individuals from all walks of life — young people in school and medical school, summer service camps, government agencies, nonprofit service agencies, alumni associations and corporate groups — visited the garden with groups to volunteer, including some dedicated souls who showed up twice a week all year. The Urban Food Studio is also actively used by CAFB staff for lunch, department meetings, staff celebrations and farewell parties and evening fundraising events. 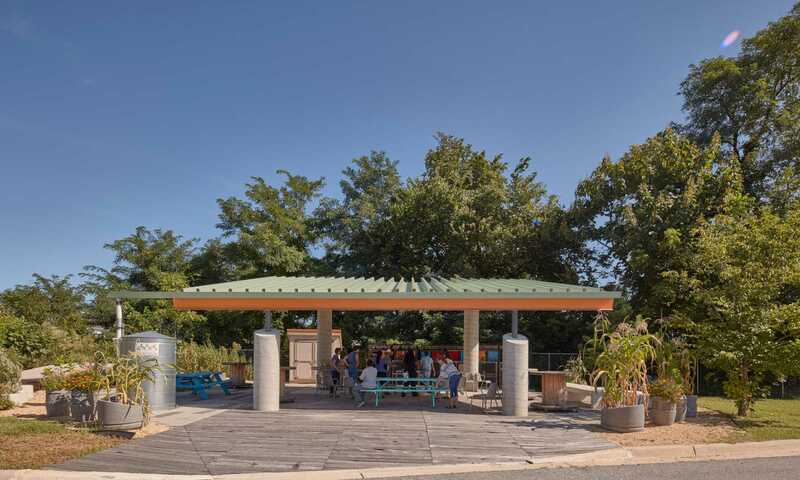 CAFB is working to secure funding for the solar panel installation that would electrify the garden, expanding the number of events that can be held in the evening, including space rental that can help generate income. Produce from the half-acre Urban Demonstration Garden is primarily used for nutrition education, cooking demonstrations and partner samplings. Extra produce is distributed to those in need through the CAFB Agency Mart. In 2017, there were 535 harvests and the garden produced 2,233 pounds of healthy food from 271 plantings. HKS continues to cultivate its relationship with CAFB through service projects. During our firmwide annual global Month of Service in October, we helped build a new compost bin for the Urban Demonstration Garden. CAFB wants to draw attention to food waste, recognizing that 40 percent of food produced in the U.S. is thrown away while one in six people are food insecure. About 700,000 residents – 16 percent of people in the D.C. metro area — are at risk of hunger. CAFB addresses hunger and minimizes excess food by connecting the surplus with populations in need, and they also reduce their own food waste by composting garden scraps. Society’s ills are many, and I am just one person. I distinctly recall a thesis critique from my graduate school days when a guest professor told me to stop trying to solve the world’s problems with my designs because it would only create more problems. But I refused to allow his comments to stunt my desire to explore the intersection of nutrition education and design to help tackle a critical health issue. I fundamentally believe that we have a responsibility to step up, show up and steward the gifts we have been given, be it our time, talent or treasure. Multiplied by the 1,350 pairs of hands within HKS, I am buoyed and inspired by the impact of the ripple effects our individual actions have on communities around the world. Motivation presents itself in different ways. Dismissing that professor’s words has nourished my career and my soul. Design that sustains the architect as well as a community is the best kind of design. Amber has over 14 years of industry experience including commercial, mixed use, residential, hospitality, healthcare and government projects.